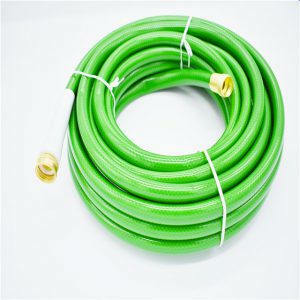 Although the general low-cost high-pressure garden hose is also made of PVC materials, also known as PVC high-pressure garden hose, which also has a knitting layer, but the service life, appearance, odor, compression, tensile strength, working pressure and other significant differences. The first odor, regardless of the first odor, this odor is made of PVC materials, in the poly (vinyl chloride) containing brominated diphenyl ether emitted, PBDE harm to human and natural environment is increasingly serious, its odor has strong persistence and irritation. Liposoluble, liver and nervous system damage to the human body, while interfering with thyroid endocrine, easy to lead to cancer. Now the United States and Europe and other countries in 2003 and 2004 have issued a document banning the manufacture of such pipes, high-pressure garden hose manufacturing must comply with ROHS and REACH standards can be used. Its second compression effect is poor, bonding strength is poor, easy to hard, hand grip like a stick, easy to fold; some high-pressure garden hose is soft to feel in winter, is a cold plastic for pipe production, plastic is phthalate ester, human body is a chronic poison, easy to cause liver and kidney function decline, blood red blood cells, with mutagenicity and mutagenicity Carcinogenicity. The three-layer braided fabric is made of inferior polyester material. The inner, outer and middle layers of the braided fabric are not strong and easy to peel off, which affects the working pressure and service life. The previous article：Let’s get together for the Canton Fair.